Few games give you the option to skip over a mission before you play it, but Call of Duty: Modern Warfare 2’s controversial “No Russian” mission is one of them. Even today, the stage that made players a terrorist remains shocking. There’s no context here whatsoever, but it suggests there’s something coming later in the game. That turned out to be the “No Russian” mission. Pretty early into Modern Warfare 2’s campaign, players assume the role of an undercover CIA agent who’s seemingly infiltrated a group of Russian terrorists under the leadership of Vladimir Makarov. Players are not sitting around a table and sipping vodka, however. Instead, they’ve joined Makarov and several others to menace a Russian airport, where they plan to mow down innocents. The mission’s title comes from Makarov; the whole reason they’re targeting the airport—and not speaking—is to ensure Americans are blamed for the incident. The opening scene, as depicted in the GIF above, is brutal. Bullets unload on an unsuspecting crowd, and the body count quickly begins to rise. Most players, thinking they needed to play along, probably decided to start shooting—at the time, I did. But the game never forces you do anything, and it’s entirely up to the player whether a single shot is fired from their gun. Dozens of people will die, regardless of what you decide to do, but active participation is left to the player. “It isn’t really relevant whether that makes you enjoy the entertainment experience even more because you’re being naughty (à la Grand Theft Auto) or it engrosses you further into the story and makes you resent your actions. What’s relevant is that the level managed to make the player feel anything at all,” he says. When the mission became public leading up to the released, it caused waves. In Japan and Germany, the game was altered to trigger a mission failed screen if players decided to shoot the civilians. In Russia, it was straight up removed. “If you are in that role, which is a terrorist in a game killing other people with massive violence coming back at you on the screen, and [you’re getting a] thrill from that, I think that’s actually sick. We need to sort that out. 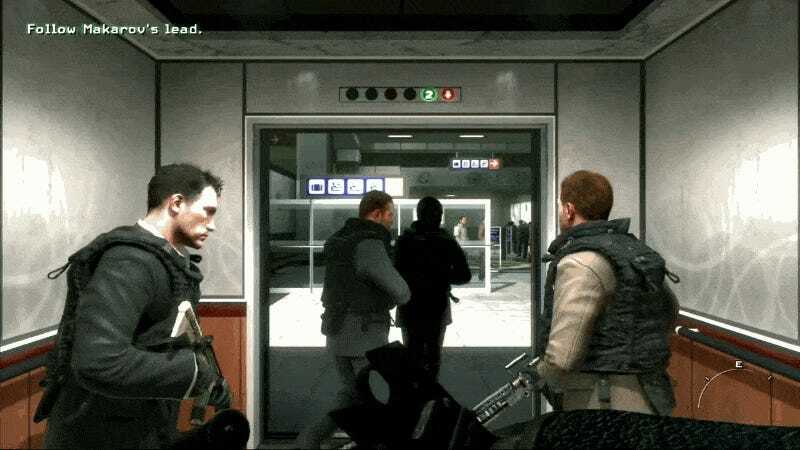 For players who felt uncomfortable with the scene, Infinity Ward tried to sidestep problems by removing any unlockables from “No Russian.” If you skipped past it, you could still get every achievement in the game.